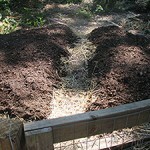 As you know, the easiest way to pursue the no till no dig way in the vegetable garden is to build a lasagna layer mound. I have written a few posts on this subject so far, mostly listing the ingredients and the order of the layers as they should be put down. 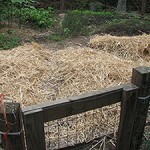 You can review the most recent post at The No Till No Dig Way: Revisiting The Lasagna Garden Mound, or view any of the articles in the No Till No Dig Way Category. I am writing this post to discuss the invisible, previously unmentioned and highly important ingredient in the no dig layer mound; Air. The mound must have air. Air is present in the mound because of the way we stack it, and because of the ingredients, particularly straw which gives the mound a great deal of structure, and air. 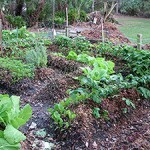 Air must be present in garden soil for there to be life, and without life our plants won’t thrive. Fresh air enters soil after water flows through pushing stale air and carbon dioxide out as it goes. Spaces for water air and other gases in soil are made by soil aggregates, earthworms tunnels, and the passage of other soil invertebrates. Plants roots take advantage of these spaces in soil taking the path of least resistance as they grow. This is also the path water takes making these spaces ideal for thirsty roots. Recently I have noticed that when my clients plan their no dig layer gardens they neglect to plan in walkways. It never occurred to me before that such an omission could be made. This is because I make mounds one at a time, and they are always strips, 8’x4′ or 10’x4′, or if along a fence two foot wide strips. I always leave pathways between the strips. My neighbor has a big square garden. 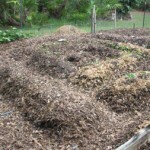 She carves beautiful fluid walkways around snaking mounds of compost, but the first time she worked with mounds in the garden she piled in lots of organic matter and then walked all over it. The pathways came during her second year of mounds. So I think I must say I am sorry to have neglected to mention the invisible ingredient Air, and the pathways, in previous posts about the no dig layer gardens. You must plan for one: pathways, and you will have both: pathways and air. Thanks as always for teaching me something new and fascinating and important! Thank you for your comment Greenmitsuko. Thanks for adding that point. Why are some people in such a rush? Is not patience a key ingredient too?